Los Angeles Times story: Predictions about life in 2013 from 1988. 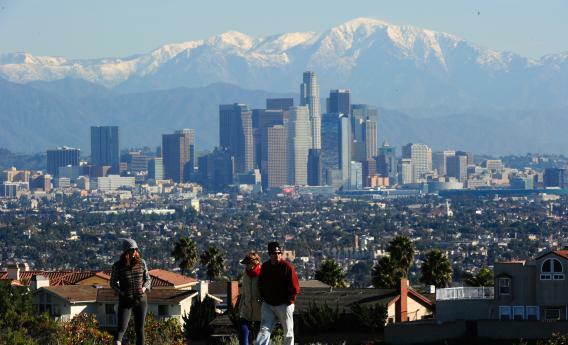 The Los Angeles skyline in 2010. If you haven’t yet, go check out this 1988 issue of the Los Angeles Times Magazine that predicted what life would be like for Angelinos in 2013. - A “staggered work plan” mandated by Los Angeles County to avoid overcrowding downtown. - “Billy Rae,” the ” mobile home robot” with a synthetic Southern drawl that rouses the family with a not-terrifying-at-all, “Hey, y’all—rise an’ shine!” And he only cost $5,000! - “Newfangled Indian cigarettes.” Say what? - To listen to music or watch a movie, you need a laser disc, or you need to call your cable company to request the media over cable lines. This whole story sort of misses the fact that Internet access has trumped the need to use of cable and phone lines. And one prediction noticeably absent from the 1988 L.A. Times Magazine story: That the L.A. Times would be embroiled in a hacking scandal involving a former Tribune Co. employee. h/t LA Times and Atlantic Wire.